Seahorses are one of the most instantly recognizable groups of aquarium fish. With prehensile tails, eyes that move independently of each other, and a long tube-like snout, there is no mistaking a seahorse! There are approximately 54 species of seahorses, all found in the single genus Hippocampus. 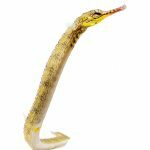 Pipefish, close relatives of the seahorse can be imagined as seahorses, with a stretched-out tail. 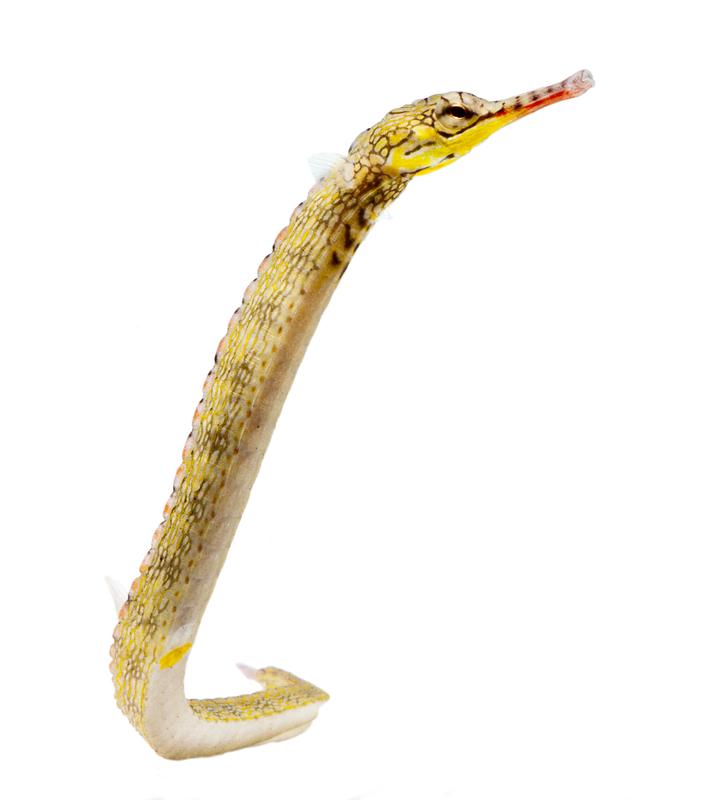 Some pipefish species possess prehensile tails, while others do not. Seahorses and pipefish are found in both temperate and tropical waters in all the world’s oceans. They display a wide range of sizes from the diminutive pygmy species reaching barely an inch, to the giant pacific seahorse that can grow to over a foot! One of the most unique aspects to seahorse and pipefish biology is their method of capturing prey. They are ambush predators, relying upon their camouflage to avoid detection and blend into their surroundings. While some seahorses and pipefish will actively seek prey, many remain anchored to a holdfast and wait for a suspecting shrimp to swim within striking distance. Seahorses and pipefish can move their eyes independently of one another and have excellent depth perception. Once, a prey organism is located, they focus, and use the suction created by their snout to snap up whole prey items. The force of this snap is s powerful, it can be heard outside of an aquarium! Another very fascinating aspect of seahorse and pipefish biology is their strategy for reproduction. Pairs undergo a very intricate courtship, in which the pair dance with one another in the morning for several days. When they are ready to mate, the pair will rise into the water column, and the female deposits eggs into the male’s fleshy pouch. Male seahorses will brood the baby seahorses in their pouch for two to four weeks, before giving birth to fully formed live young. In pipefish, the males do not possess a completely formed pouch, but instead hold the eggs on their underside. In the wild seahorses and pipefish consume exclusively live prey items such as amphipods and mysis. In captivity they thrive on a diet of high quality frozen mysis shrimp. 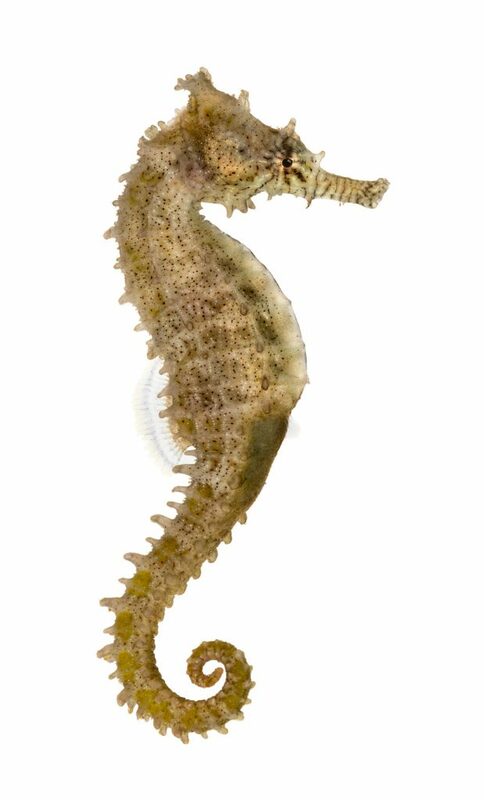 Recently captured seahorses may require a transition, or training period to convert to consuming frozen mysis. Fortunately, captive bred seahorses are widely available today and are raised on a diet of frozen mysis. Many species of seahorses and pipefish do not require a very large tank. However, it is important to consider carefully what species may be best for your aquarium. We suggest a diet based on Piscine Energetics Frozen Mysis and Piscine Energetics Frozen Calanus.